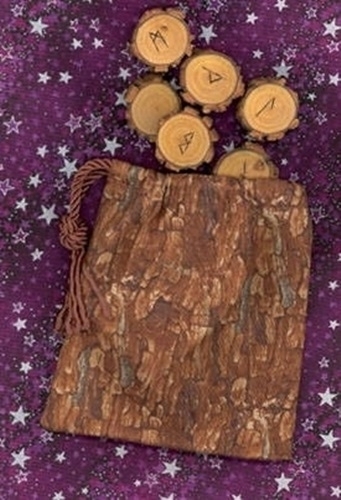 Short Bags - Dark Bark Rune Bag - Tarot Bags, Tarot Cards, Cloths, & More! The textural pattern of this Dark Bark Short Bag conjures the sense of hiking in a vast pine forest... pine needles crunching underfoot, the sharp, sweet nutty scent of pine in the air. This bag will make any nature lover happy! The rough, chunky pine tree bark pattern makes this a perfect home for your wooden rune sets or ogham sticks. It's also a wonderful match for Native American themed small or mini decks, like the Mini Motherpeace Round Tarot. Symbolism: Pine trees of many different varieties grow all over the world. In northern Europe, the vast stretches of forests filled with pines, firs, and spruces were said to be the dwelling places of fairies and gnomes. In many European traditions pines are symbols of prosperity and good fortune. Because their needles stay green throughout winter, they represent vitality and protection. To the Iroquois tribe in the northeast US, the pine tree symbolizes peace. Its bark is burned to ward off conflict and nightmares. The pi�on pine that grows across the American southwest is considered sacred and its pitch is used to protect against evil magic. Beliefs associated with pine trees exist in most cultures around the world. Pine is a sacred and much beloved tree.